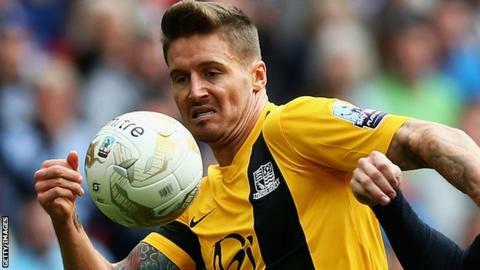 Barry Corr's brace helped Cambridge United to an opening-day victory against visiting Newport County. The forward struck with a perfectly placed header from Harrison Dunk's delivery, before claiming his second when one-on-one with keeper Joe Day. Newport were awarded a penalty when Dunk fouled Scott Boden, but Sam Beasant read Medy Elito's spot kick. Robbie Simpson settled any Cambridge nerves 10 minutes from time, driving home from the edge of the area. Newport County manager Terry Butcher told BBC Wales Sport: "Three-nil is a hammering but I don't think it was a hammering at all. "We had good possession of the ball and first half I thought it was even-stevens, we've hit the post and had one or two other opportunities. "When we were 2-0 down we were trying to chase the game and I gambled and put on an 18-year-old and a 17-year-old but there you go, that's all we have." Match ends, Cambridge United 3, Newport County 0. Second Half ends, Cambridge United 3, Newport County 0. Corner, Newport County. Conceded by Leon Legge. Corner, Newport County. Conceded by Conor Newton. Corner, Newport County. Conceded by Harrison Dunk. Tom Owen-Evans (Newport County) wins a free kick on the left wing. Substitution, Newport County. Regan Poole replaces Kevin Feely. Goal! Cambridge United 3, Newport County 0. Robbie Simpson (Cambridge United) right footed shot from the centre of the box to the bottom left corner. Assisted by Gearoid Morrissey. Substitution, Cambridge United. Robbie Simpson replaces Jordan Slew. Danny Holmes (Newport County) wins a free kick in the attacking half. Attempt missed. Tom Owen-Evans (Newport County) right footed shot from the centre of the box is just a bit too high. Penalty saved! Medy Elito (Newport County) fails to capitalise on this great opportunity, right footed shot saved in the top right corner. Penalty Newport County. Scott Boden draws a foul in the penalty area. Penalty conceded by Harrison Dunk (Cambridge United) after a foul in the penalty area. Substitution, Newport County. Tom Owen-Evans replaces Alex Rodman because of an injury. Substitution, Cambridge United. Gearoid Morrissey replaces Josh Coulson. Goal! Cambridge United 2, Newport County 0. Barry Corr (Cambridge United) right footed shot from the centre of the box to the top right corner. Assisted by Jordan Slew following a fast break. Substitution, Newport County. Aaron Collins replaces Lenell John-Lewis because of an injury. Corner, Newport County. Conceded by Keith Keane. Attempt blocked. Medy Elito (Newport County) left footed shot from outside the box is blocked. Attempt missed. Jordan Slew (Cambridge United) header from the centre of the box is close, but misses to the left following a set piece situation. Delay in match Kevin Feely (Newport County) because of an injury.